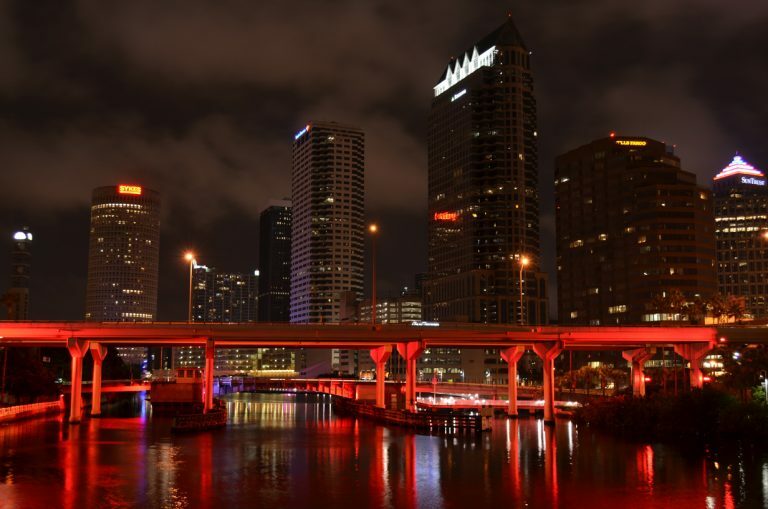 LED lights illuminate the Selmon Expressway bridge over the Hillsborough River in an array of colors. The span joins Downtown Tampa with Hyde Park. Photo taken September 6, 2015. Taking an east-west course across Tampa, Florida 618 is the tolled Selmon Crosstown Expressway. Partially an elevated highway, the state road is the most direct route between Brandon and Downtown, and the fastest way across South Tampa to the Gandy Bridge along U.S. 92. In 1960, planners wanted to build a second east/west freeway in Tampa about five miles north of Interstate 4. Traffic along Florida 574 would eventually be too much for the arterial to handle, and it would require a separate freeway corridor in addition to Interstate 4. In 1962, a feasibility study done by Wilbur Smith and Associates told the Department of Roads that the freeway would better serve needs south of Interstate 4 and more efficiently address traffic demands from the burgeoning suburban areas of Brandon and South Tampa. 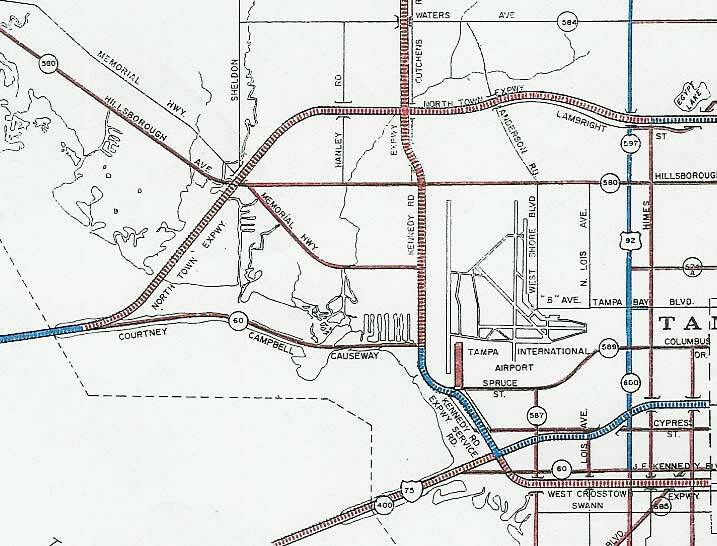 The 1962 freeway plan shows the Crosstown Expressway basically in the same place it was eventually built. West of Downtown the freeway followed a railroad and split at US 92. The western arm would traverse the Gandy Bridge to St. Petersburg and the southern arm would go south through MacDill AFB and over the Hillsborough Bay Causeway to connect back to Interstate 75 near Apollo Beach. East of Downtown, the expressway was labeled as the "Palm River Expressway" and was planned to link to what was eventually proposed as the Interstate 75E bypass east of Tampa. 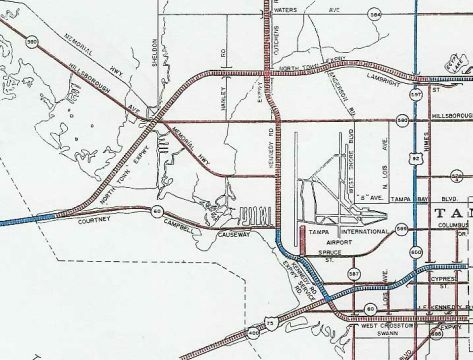 1962 plans also incorporated a West Crosstown Expressway running parallel to Kennedy (Grand Central) Boulevard to Memorial Highway north to Tampa International Airport (TPA) and the North Town Expressway, a belt route encircling Town 'N Country and Drew Park across Tampa. 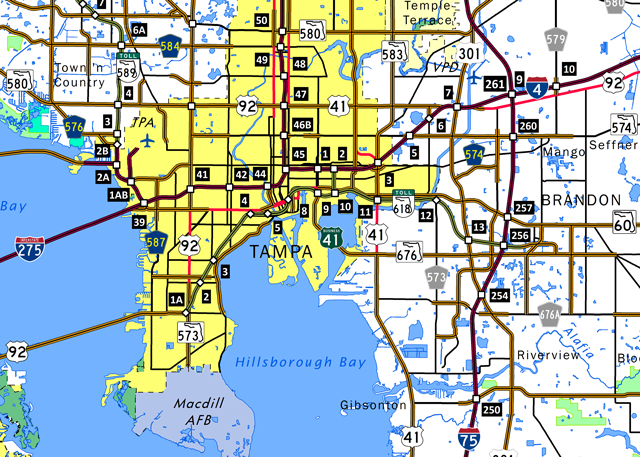 Issues arose with these routes as they were planned through the densest, and sometimes wealthiest areas in Tampa. Community opposition and the high cost of land acquisition for the corridors led to their cancellation by 1980. In 1966, when the Tampa Times ran an article on the traffic ills of Interstate 4, it was time to begin building the Crosstown Expressway, a reliever route. The first portion of the road built would be from Gandy Boulevard to Downtown, and people were none too happy about it. Critics and the media blasted the plan to build the western leg of the road first, saying no one would use it and it would be a colossal waste of money. The western leg was built first because the railroad gave the land next to its track to the state for free, it was cheaper. In the beginning, however, the critics were right. The first year the new road only received a third of the projected traffic, no one wanted to pay the dime to drive it when other free roads were available. The Tampa Expressway authority, in their desperation, gave away free travel days and put up billboards on other roads to get people to try out the Crosstown, still, few did. In 1975 a contest was held to design a logo for the road, it got one entry, the images of Jose Gasparilla that graced the road until 2002 and 2008, when replacement shields featured a new design or the Toll Florida 618 designation. Usage of the road climbed when the eastern portion was constructed in the 1980s, and in 1986 when the Crosstown was connected to Interstate 75 in Brandon ridership shot up almost 25%. Still, the road could not cover its own debt payments until 1995 - and it has covered those payments every year since. Until 2002, none of the trailblazers along this route showed Florida 618, as this was a hidden designation. That changed with the creation of a newer reassurance shield and trailblazer. This led to four kinds of trailblazers for the Selmon Crosstown Expressway: (1) Toll Florida 618 shields, (2) white shields with the words "Selmon Crosstown Expressway" and the image of a pirate hat, (3) royal blue squares with the picture of a buccaneer on them, and/or (4) black on white signs with the words in plain text "Tampa Crosstown Expressway." The latter signage was the oldest. 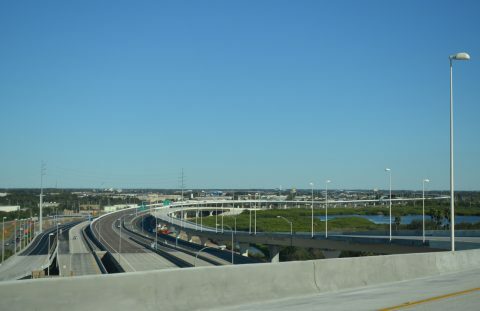 A new trailblazer for the Lee Roy Selmon Expressway was unveiled by the Tampa Hillsborough Expressway Authority on July 28, 2008. This coincided with the dropping of "Crosstown" from the expressway name. These signs replaced all other types of trailblazers. Two extensions of the Crosstown Expressway have been planned and, officially, are still on the books. The eastern extension into Brandon along Florida 60 was debated on and planned in the late 1980s but was effectively killed by local opposition. The eastern extension is not likely to be built, and it was not in the mid-2000s county 20-year transportation plan. The western extension of the expressway dates back to 1975, when detailed plans for the expressway were drawn. The state eventually spent some money acquiring land, but lacked the $70 million to build the road. Opposition arose from business leaders along Gandy Boulevard (U.S. 92), which would lose traffic to the Crosstown Expressway. No progress was made in the ensuing decades, leaving motorists without a direct connection between the Crosstown Expressway and the Gandy Bridge across Tampa Bay. The Tampa Hillsborough Expressway Authority (THEA) conducted a poll for the Selmon Extension Pier design in fall 2017. Receiving 74% of the 1,805 votes cast, the Estuary design was selected on October 23, 2017.6 Grading work for the Selmon Extension was underway along U.S. 92 (Gandy Boulevard) by January 2018. Work extends through fall of 2020, when the two-lane toll road above the median of U.S. 92 opens to traffic. The Selmon Extension will bypass signalized intersections with West Shore Boulevard, Manhattan Avenue and Lois Avenue, directly linking with the Gandy Bridge. All tolls will be collected electronically. A major improvement to the Selmon Expressway was the reversible lanes project. Comprising a six-mile viaduct in the median of the LeRoy Selmon Expressway, between Channelside and Brandon, the express lanes were first proposed in 1996. Construction was originally expected to be complete by summer 2005, but the April 2004 collapse of two 150 foot bridge spans, when a column sank 11 feet,2 delayed the project to a July 18, 2006 opening. The lanes flow inbound during the morning commute and outbound during the evening peak hours. Funded in part by federal stimulus funds, the $421-million3 Crosstown connector opened to traffic on January 6, 2014. The elevated route links Interstates 4, State Road 618 and Port Tampa Bay through Ybor City in Tampa. The north-south expressway is unnumbered, as FDOT references the Selmon Connector as a series of ramps. The high-speed connector provides a truck route replacing State Road 585 (21st & 22nd Streets) through the Ybor City street grid. Soaring to a height of 92 feet,3 the connector uses electronic toll collection and is accessible in all directions of I-4 and SR 618. Two ramps also lead directly to U.S. 41 Business for trucks bound to and from Port Tampa Bay. Looking east from the high flyover carrying traffic from I-4 east onto Florida 618 east at Ybor City. The Selmon Expressway mainline and express lanes crosses over what was 39th Street below. An interchange once connected Florida 618 with Florida 569 there. Photo taken January 18, 2014. 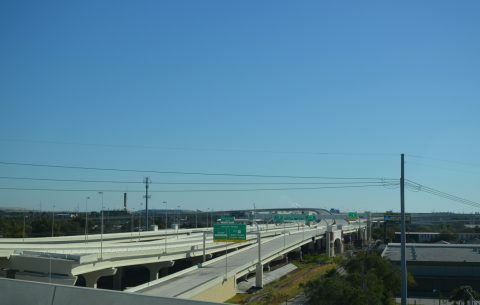 The Selmon Connector consists of a series of elevated roadways linking Interstate 4 with Florida 618 through Historic East Ybor City. Ramp stubs were incorporated into the north end to eventually tie into Express toll lanes for I-4. Photo taken January 18, 2014. Euclid Avenue crosses a CSX Railroad line ahead of the northbound on-ramp to Florida 618 (Lee Roy Selmon Expressway). 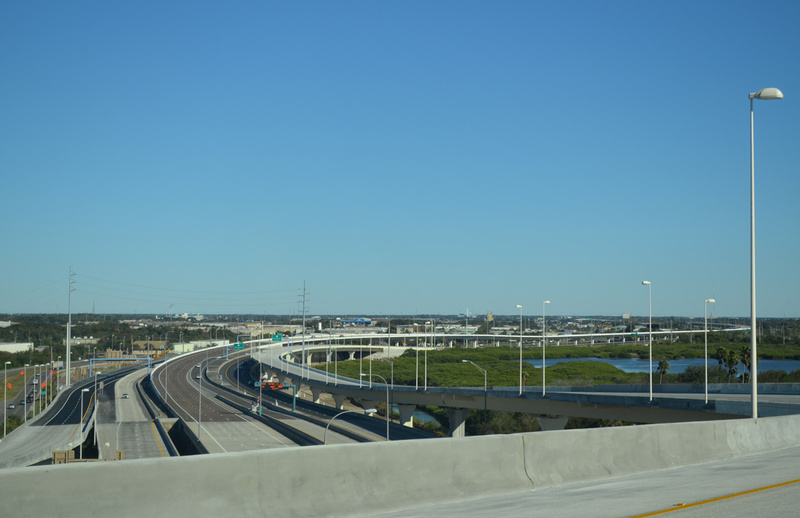 The half diamond interchange joins the Bayshore Beautiful neighborhood with Downtown Tampa. Photo taken 04/22/15. All signs at SR 618 on-ramps were changed to reflect the conversion to AET on September 17, 2010. This sign stands at the entrance ramp from Euclid Avenue. Photo taken 04/22/15. The trailblazer selected in 1975 for the Tampa Crosstown Expressway. These signs were slowly replaced by SR 618 shields from 2002 to 2008, when a new sign design debuted for the Selmon. Photo taken 10/28/03. Second photo taken 12/27/00. Falkenburg Road meets the Lee Roy Selmon Expressway (SR 618) ahead at a half diamond interchange. A ramp leads to SR 618 west toward Downtown Tampa. This stretch of Falkenburg Road between Palm River Road and the Selmon Expressway was completed in 1999, connecting the two pieces. Photo taken 09/25/15. "Crosstown Expressway." Bayciti - Tampa Bay Urban Blog. Cozart, Justin, April 5, 2005. September 23, 2015. "Expectations Rise for Expressway." The Tampa Tribune, March 1, 2006. "Selmon link to I-4 nears completion." The Tampa Tribune, December 12, 2013. "Selmon Expressway Converts to All-Electronic Tolling Sept. 17." Tampa Hillsborough County Expressway Authority, press release. August 13, 2010. "Work on a Gandy expressway revs up this week." Tampa Bay Business Journal, August 30, 2017. THEA Announces "Estuary" as the Winning Selmon Extension Pier Design. Tampa Hillsborough Expressway Authority, news release. October 23, 2017.